Ana Sayfa VEMBU Vembu BDR Suite v3.9.1 GA Released ! Vembu BDR Suite v3.9.1 GA Released ! Vembu is pleased to announce the latest release of their flagship offering, i.e. Vembu BDR Suite v3.9.1 which includes a Standard Editiondesigned keeping Small businesses in mind. Vembu BDR Suite has been satisfying all these demands for a long time now. It is a comprehensive solution, designed to protect critical data across hybrid IT environments like Physical, Virtual, and Cloud (SaaS applications). After making noteworthy progress and ensuring utmost customer satisfaction, we are pleased to announce our next version release of the Vembu BDR Suite v3.9.1 which is Generally Available now and is ready for download from today. Let me give you a quick recap of how the previous version Vembu BDR Suite v3.9.0 worked. To be precise, in the v3.9.0 release, Vembu focused on the improvement of Data restoration, Storage, and Security of the Data. The key highlight of Vembu BDR Suite v3.9.1 is the launch of New Standard Edition of Vembu BDR Suite. 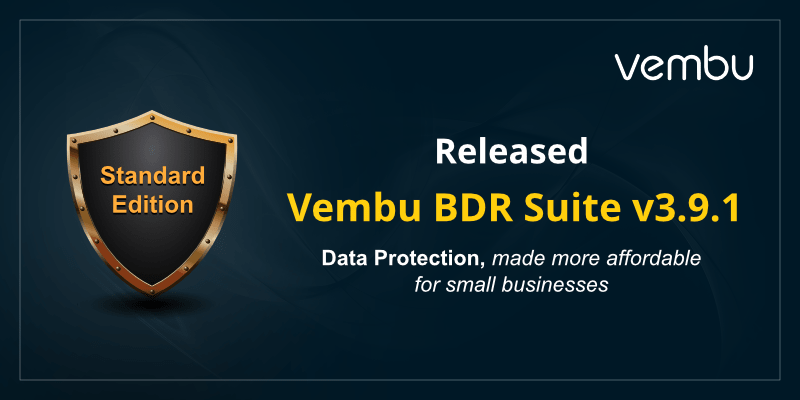 In the previous versions, Vembu BDR Suite was available only in the single edition for all businesses. With the release of v3.9.1, Vembu BDR Suite is now available in 2 editions: Standard and Enterprise. The users can choose the edition that best suits their business needs. The most daunting task for SMBs in implementing a BDR solution for their IT infrastructure is the budgetary constraints. Considering this in mind, Vembu announced the Standard edition of its flagship offering to keep the cost of the product affordable for everyone.